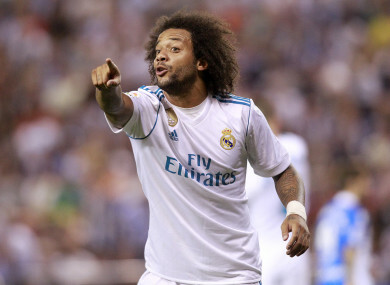 Authorities believe Marcelo hid €490,917 earned from his image rights. Marcelo has made over 200 appearances for Real Madrid in La Liga. SPANISH PROSECUTORS HAVE accused Real Madrid’s Brazilian left-back Marcelo of tax fraud totalling nearly half a million euros, a judicial source confirmed on Tuesday. The tax authorities believe Marcelo hid €490,917 earned from his image rights using a network of shell companies outside of Spain. According to court documents, Marcelo earned €1,168,764 from his image rights in 2013, which were ceded to a Uruguayan company but should have been declared to the Spanish authorities. Marcelo is just the latest in a series of star players based in Spain to be accused of tax fraud on income related to image rights in the past few years. Real Madrid’s all-time leading scorer Cristiano Ronaldo appeared in court in July over accusations he evaded 14.7 million worth of tax between 2011 and 2014. Barcelona duo Lionel Messi and Javier Mascherano received 21-month and one-year suspended sentences respectively after being found guilty of tax fraud over their image rights in 2016. However, five-time World Player of the Year Messi’s sentence was later replaced by a €252,000 fine. Email “Real Madrid star accused of half a million euro tax fraud”. Feedback on “Real Madrid star accused of half a million euro tax fraud”.